. : Farm Forest Line - Tree basal area:. 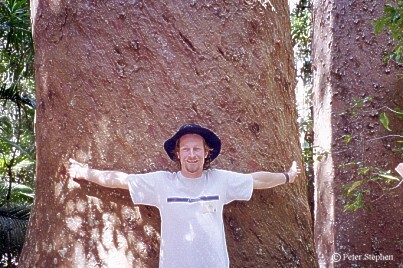 Tree Basal Area (TBA) is the cross-sectional area (over the bark) at breast height (1.3 metres above the ground) measured in metres squared (m2). TBA can be used to estimate tree volumes and stand competition. To determine Tree Basal Area simply measure the diameter at breast height in centimetres (DBHOB) and calculate the basal area (m2) using an equation based on the formula for the area of a circle (area = p r2 where r = radius and p = 3.142 ) and the formula for radius (r=diameter/2 = DBH/2). This formula also converts the diameter in centimetres to the basal area in square metres. The same technique can be used to calculate the cross sectional area of the tree at any point along the stem. Tree Basal Area is the cross-sectional area of a tree at breast height.